The hunt for Whales and seals was the reason for the initial exploration of Antarctica. Reports of abundant stocks drew the adventurous from the early 1800's onwards. Before long there were major crashes in the populations of some wildlife. The Antarctic fur seal for example was almost totally wiped out at many locations by 1830 leading to a decline in the sealing industry although it continued on a smaller scale well into the 1900's. On the continent of Antarctica itself no Antarctic bird or mammal can be killed or captured without a permit - these are granted only for scientific reasons under the terms of the Antarctic Treaty. Though crucially this does not apply to the Antarctic Ocean. The story of Antarctic whaling is one of greed and excess. Once the most profitable species had been hunted to a point of great scarcity, the next species was hunted until it too was very rare, then the next and so on, Blue, Fin, Sei, then Minke whales in that order. The Antarctic whale fishery has been described as being more like mining rather than a sustainable fishery. The International Whaling Commission (IWC) was set up to attempt to regulate the industry to a position of sustainability (where catches are balanced by production) but was widely regarded at failing in this. The only thing that eventually did drive many companies out of the whaling business was a fall in profits due to a lack of whales when there weren't many left to kill any more. Slowly however the IWC did have some impact. In the 1960s blue and humpback whales were fully protected, protection that was then extended to fin and sei whales in the 1970s. In 1986 the IWC suspended all commercial whaling. Whales are protected by the International Convention for the Regulation of Whaling, the founding document of the IWC, first signed in 1946. Commercial whaling has all but stopped worldwide but some nations particularly Japan and Norway continue to kill whales, Japan has come under criticism for doing this under the guise of a 'scientific take' - taking whales for scientific research reasons. The "Scientific Reasons" for such whaling is to find out if the time has arrived to recommence commercial whaling again, not what you might imagine the purpose of scientific research to be. These "scientifically" caught whales end up in restaurants and one whale can have a $1,000,000 market value at the restaurant table. 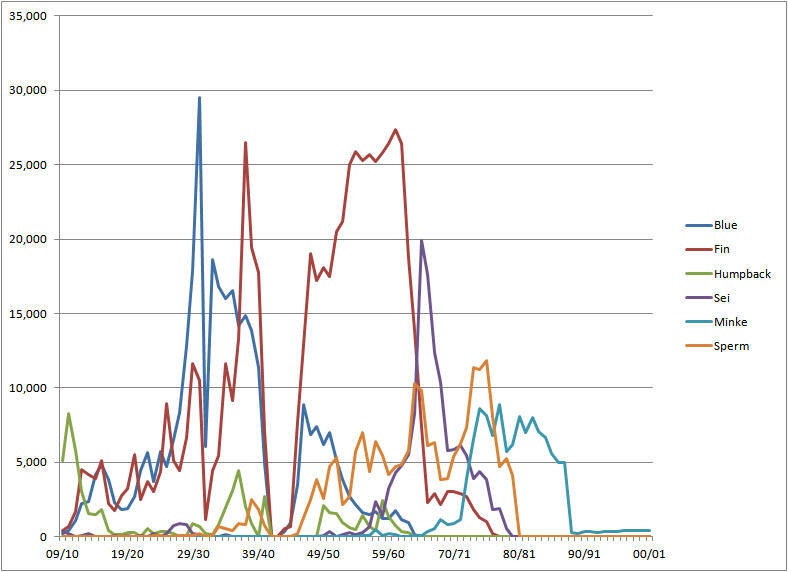 Whale catches by year from the 1909-1910 Antarctic whaling season to 2000-2001 by species. Humpback Whales were targeted early on until the technology was developed to target faster swimming Blue Whales, as the Blues declined, the next biggest species, Fin Whales were targeted, then as they declined, Sei whales and eventually as all species became scarce, even the much smaller Minke was taken that previously had been dismissed as too small to make it worth the effort The large dip corresponds to the Second World War when whales were able to gain a respite and start to recover their numbers, though not for long. Note - The Antarctic whaling season is in the austral (southern hemisphere) summer from November to March, and spans part of two calendar years, so seasons are referred to as 39/40 meaning from November 1939 to March 1940 for instance. Whales like all large animals are slow breeders, the world population of whales is still far below what it is thought to have been prior to human whaling activities. For blue whales for instance, the generation time is about 31 years, the current world population is estimated at 10,00 - 25,000, this is 3 - 11% of the pre 1911 population when industrial whaling with explosive harpoons and fast catcher boats started. So prior to 1911, the world population was anywhere between 91,000 and 800,000. At the very least, the population is increasing, but the world is still very short of blue (and other large, baleen) whales. In the 1700's and 1800's, southern fur seals (as found in Antarctica and the sub-Antarctic) were almost completely wiped out by commercial ventures from Europe and North America. The pelts were very popular for their dense short fibred fur that and were made into ladies coats. 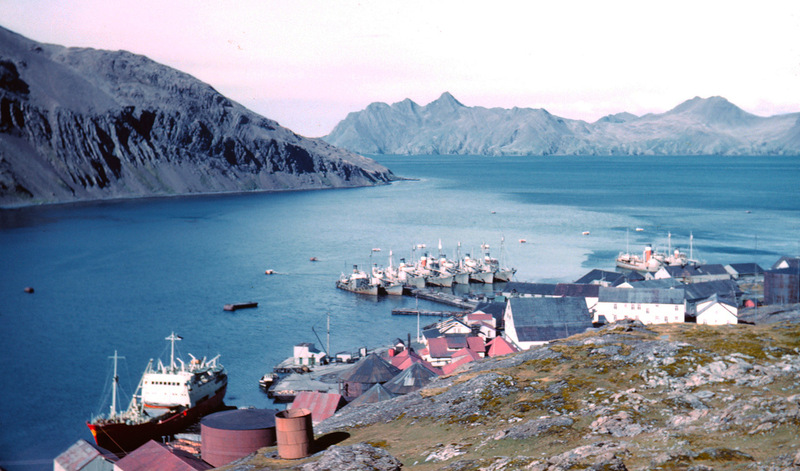 Captain James Cook visited the island of South Georgia in 1775 and reported that there a great many seals present. Within 25 years of being discovered, the summer catch had climbed to 112,000 animals. By 1822, the southern fur seal was virtually extinct on South Georgia. Somewhat ironically it was the quest for new populations of fur seals that led to much of the early exploration of Antarctica and the Southern Ocean. One of the very first sightings of the Antarctic continent was made by an American sealer, Nathaniel Palmer on Nov 16th 1820. The very first overwintering in Antarctica in 1821 was by 10 crew and an officer from the British sealing ship Lord Melville on King George Island just north of the Antarctic Peninsula (though it wasn't planned and they didn't volunteer!). By the beginning of the 1900's the southern fur seal was a rare animal, a lone male was sighted on South Georgia in 1916 and duly killed. In 1931 a scientific expedition discovered a small breeding colony of a few hundred on Bird Island a few miles from South Georgia. The decline of the fur seal coincided with the rise of whaling. Baleen whales and fur seals both feed on the same food - krill. As the whales were slaughtered in ever increasing numbers so there was ever more krill available for the fur seals to feed on. By the end of the 1950's the world population of fur seals stood at about 5,000, by 1976 on South Georgia alone it had reached 100,000. Today about 95% of the world population of southern fur seals breed on South Georgia. In 1993 the estimated population was around 1.5 million with more and more seals being found further away from South Georgia and beginning to breed further afield too. The population in 2015 is estimated to be around 4 million though it is difficult to gauge very accurately. The Convention for the Conservation of Antarctic Seals (CCAS) was initiated in 1972 in response to exploratory research into the viability of a recommencement of sealing was carried out in the 1960's although it never did start again. The purpose was to avoid the earlier over-exploitation and the disastrous effects on seal stocks. The CCAS established rules for commercial sealing with permissible catch limits for some species such as crabeater, leopard and Weddell seals. A zoning system was also drawn up with closed hunting seasons. Total protection was given for the very rare Ross seal, also for southern elephant seals and certain species of fur seal. No commercial sealing has been carried out in Antarctica since the 1950's.Seals were killed in order to provide food for dog teams that were stationed in Antarctica up to the point where the dog teams were finally removed due to worries that the disease of canine distemper might spread to seals in 1994. There is currently no commercial sealing in Antarctica and there are no plans to resume.